Citation Information: J Clin Invest. 2003;111(10):1519-1527. https://doi.org/10.1172/JCI15496. Chronic hypoxia induces pulmonary vascular remodeling, leading to pulmonary hypertension, right ventricular hypertrophy, and heart failure. Heterozygous deficiency of hypoxia-inducible factor–1α (HIF-1α), which mediates the cellular response to hypoxia by increasing expression of genes involved in erythropoiesis and angiogenesis, has been previously shown to delay hypoxia-induced pulmonary hypertension. HIF-2α is a homologue of HIF-1α and is abundantly expressed in the lung, but its role in pulmonary hypertension remains unknown. Therefore, we analyzed the pulmonary response of WT and viable heterozygous HIF-2α–deficient (Hif2α+/–) mice after exposure to 10% O2 for 4 weeks. In contrast to WT mice, Hif2α+/– mice were fully protected against pulmonary hypertension and right ventricular hypertrophy, unveiling a critical role of HIF-2α in hypoxia-induced pulmonary vascular remodeling. Pulmonary expression levels of endothelin-1 and plasma catecholamine levels were increased threefold and 12-fold respectively in WT but not in Hif2α+/– mice after hypoxia, suggesting that HIF-2α–mediated upregulation of these vasoconstrictors contributes to the development of hypoxic pulmonary vascular remodeling. Citation Information: J Clin Invest. 2003;111(9):1373-1380. https://doi.org/10.1172/JCI15211. Insulin receptors (IRs) on vascular endothelial cells have been suggested to participate in insulin-regulated glucose homeostasis. To directly address the role of insulin action in endothelial function, we have generated a vascular endothelial cell IR knockout (VENIRKO) mouse using the Cre-loxP system. Cultured endothelium of VENIRKO mice exhibited complete rearrangement of the IR gene and a more than 95% decrease in IR mRNA. 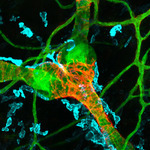 VENIRKO mice were born at the expected Mendelian ratio, grew normally, were fertile, and exhibited normal patterns of vasculature in the retina and other tissues. Glucose homeostasis under basal condition was comparable in VENIRKO mice. Both eNOS and endothelin-1 mRNA levels, however, were reduced by approximately 30–60% in endothelial cells, aorta, and heart, while vascular EGF expression was maintained at normal levels. Arterial pressure tended to be lower in VENIRKO mice on both low- and high-salt diets, and on a low-salt diet VENIRKO mice showed insulin resistance. Thus, inactivation of the IR on endothelial cell has no major consequences on vascular development or glucose homeostasis under basal conditions, but alters expression of vasoactive mediators and may play a role in maintaining vascular tone and regulation of insulin sensitivity to dietary salt intake. Citation Information: J Clin Invest. 2003;111(8):1201-1209. https://doi.org/10.1172/JCI14172. Tetrahydrobiopterin is a critical cofactor for the NO synthases, and in its absence these enzymes become “uncoupled,” producing reactive oxygen species (ROSs) rather than NO. In aortas of mice with deoxycorticosterone acetate–salt (DOCA-salt) hypertension, ROS production from NO synthase is markedly increased, and tetrahydrobiopterin oxidation is evident. Using mice deficient in the NADPH oxidase subunit p47phox and mice lacking either the endothelial or neuronal NO synthase, we obtained evidence that hypertension produces a cascade involving production of ROSs from the NADPH oxidase leading to oxidation of tetrahydrobiopterin and uncoupling of endothelial NO synthase (eNOS). This decreases NO production and increases ROS production from eNOS. Treatment of mice with oral tetrahydrobiopterin reduces vascular ROS production, increases NO production as determined by electron spin resonance measurements of nitrosyl hemoglobin, and blunts the increase in blood pressure due to DOCA-salt hypertension. Endothelium-dependent vasodilation is only minimally altered in vessels of mice with DOCA-salt hypertension but seems to be mediated by hydrogen peroxide released from uncoupled eNOS, since it is inhibited by catalase. Tetrahydrobiopterin oxidation may represent an important abnormality in hypertension. Treatment strategies that increase tetrahydrobiopterin or prevent its oxidation may prove useful in preventing vascular complications of this common disease. Citation Information: J Clin Invest. 2003;111(6):897-906. https://doi.org/10.1172/JCI14915. Human atherosclerotic lesions overexpress the lysosomal cysteine protease cathepsin S (Cat S), one of the most potent mammalian elastases known. In contrast, atheromata have low levels of the endogenous Cat S inhibitor cystatin C compared with normal arteries, suggesting involvement of this protease in atherogenesis. The present study tested this hypothesis directly by crossing Cat S–deficient (CatS–/–) mice with LDL receptor–deficient (LDLR–/–) mice that develop atherosclerosis on a high-cholesterol diet. Compared with LDLR–/– mice, double-knockout mice (CatS–/–LDLR–/–) developed significantly less atherosclerosis, as indicated by plaque size (plaque area and intimal thickening) and stage of development. These mice also had markedly reduced content of intimal macrophages, lipids, smooth muscle cells, collagen, CD4+ T lymphocytes, and levels of IFN-γ. CatS–/–LDLR–/– monocytes showed impaired subendothelial basement membrane transmigration, and aortas from CatS–/–LDLR–/– mice had preserved elastic laminae. 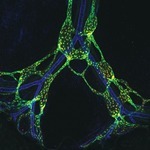 These findings establish a pivotal role for Cat S in atherogenesis. Citation Information: J Clin Invest. 2003;111(1):51-60. https://doi.org/10.1172/JCI14076. The adhesion receptors known as integrins perform key functions for hematopoietic cells. The platelet integrin αIIbβ3 is critical in hemostasis, and the β1 and β2 integrins on leukocytes have many roles in cell-mediated immunity. Mutations in the β2 subunit lead to integrin nonexpression and to an immune deficiency, leukocyte adhesion deficiency-1. Mutations in either the α or β subunit of αIIbβ3 usually lead to integrin nonexpression and a bleeding tendency termed Glanzmann thrombasthenia. Here we describe a unique patient with clinical features of both Glanzmann thrombasthenia and leukocyte adhesion deficiency-1. The patient has normal expression of β1, β2, and β3 integrins, but all are dysfunctional. The key findings are that “inside-out” signaling pathways leading to integrin activation are defective and that this is associated with abnormal integrin clustering. The integrins themselves are intact and capable of function following extracellular stimulation. T cell motility is normal, as are the expression levels and electrophoretic characteristics of all cytoskeletal and signaling proteins tested, except PKC-α, which has enhanced expression in the patient’s cells. To our knowledge, this is the first description of a dysfunction affecting three classes of integrins. We propose that it is caused by a lesion in an intracellular factor or signaling pathway essential for integrin activation in hematopoietic cells and results in lack of regulation of clustering, an essential component of integrin-mediated adhesion. Citation Information: J Clin Invest. 2002;110(11):1729-1738. https://doi.org/10.1172/JCI15481. Citation Information: J Clin Invest. 2002;110(9):1275-1282. https://doi.org/10.1172/JCI15082. Citation Information: J Clin Invest. 2002;110(7):933-941. https://doi.org/10.1172/JCI14268. Citation Information: J Clin Invest. 2002;110(5):625-632. https://doi.org/10.1172/JCI15334.